ARC’s Construction Project Closeout solution puts an end to closeout clutter and confusion and helps you execute project closeouts, and receive final payment, in record time. Achieve 1-week closeouts with document management that takes the usual stress and disorganization out of compiling your final construction documents. 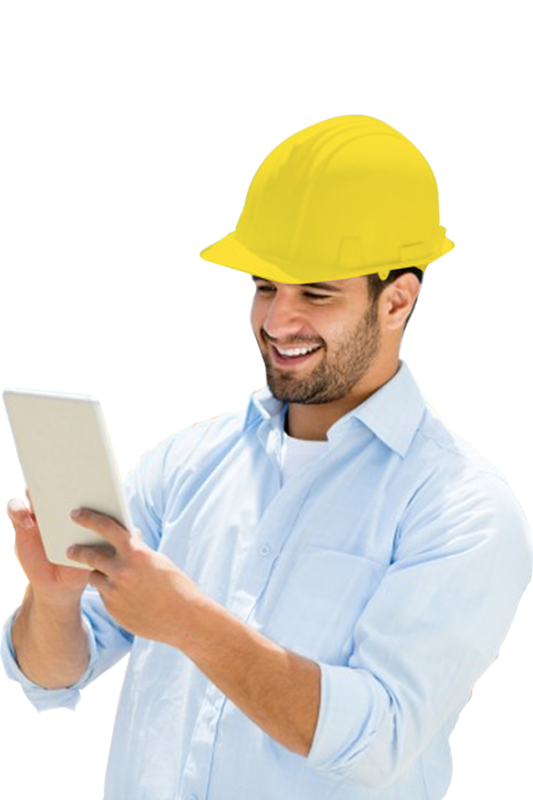 As-builts, O&M manuals, warranties, submittals, permits, and more are hyperlinked and indexed, along with all historical versions and revisions, and delivered in one easily navigable PDF that maintains your folder structure. Depending on how well you manage construction project closeout, it can solidify your reputation with a client or lead to cracks in the foundation of your relationship. The importance of project closeout cannot be overstated, yet the process can be taxing for everyone. What is construction closeout? This process requires diligent tracking and coordination to address any outstanding issues and avoid delays. Field and office need to collaborate and ensure all change orders have been addressed, all work has been completed, all aspects of the project have been finalized and signed off on, and much more before you can hand off to your client. Most construction projects amass thousands of pages of documents; sifting through them to compile and organize a comprehensive deliverable can be overwhelming if your documents weren’t managed efficiently during the project. And, with project teams and subcontractors itching to move on to the next job, you may find yourself chasing down documents that delay your final payment and impact the project’s overall profitability. When you finish a job, you want to leave a final impression that’s as good as the first one you made--it’s the impression that won you the job, after all. However, as any industry veteran well knows, project closeouts can be as challenging as the project itself. While the old adage, “You’re only as good as your last at-bat,” can indeed be adapted to the high stakes world of the construction industry, it’s not the project that will make or break your final impression: it’s your closeout. The closeout experience you provide to owners and stakeholders are the last bricks that you’ll lay on your project, and they can build a path to either repeat business or closed doors. 90% of project closeout documents are still in paper form. While shifting to a digital document management system would be ideal, the reality is that even your digital documents can end up scattered and unmanageable when you don’t have a streamlined solution with consistent standards in place. For firms who want to hand off a closeout package that’s as good as the project itself, ARC has a solution. When you partner with ARC, we begin by helping you collect all of your construction closeout documents. Whether your project information is digitized, on paper, or exists as a mix of both, our team will ensure that it’s all scanned, tagged, linked, and organized in the way that makes the most sense for your business. In the office or on the job, access permits, submittals, as-builts, spec sheets, and more with just a tap from your custom dashboard on our industry-leading mobile closeout tool, ARC SKYSITE. When your work is done, and all that’s left to do is hand off, your closeout deliverable maintains your hyperlinks, indexing, and folder structure and compiles all historical versions of your documents including markups and revisions in one easy-to-navigate PDF. The closeout stage of your project is just as critical as everything you completed along the way, yet many projects fizzle out as they near an end. Your project team and subcontractors are ready to move on to other work, but you still need them to provide you with critical documentation. With ARC Project Closeouts, your closeout documents are right where you need them, and your deliverable is ready when you are. Take your closeouts from chaotic to calm with ARC’s Project Closeout solution. Generate accurate and interactive as-builts, streamline sign-offs, submittals, and easily access O&Ms, warranties, and more directly from your mobile project dashboard. Your closeout deliverable is ready when you are and maintains your folder and hyperlinking architecture, making it easy not only to get to deliver your final documents, but for your client to navigate, understand, and interact with them, too. Hand over a comprehensive deliverable that adds real value to owners, stakeholders, and facility managers. Your indexes, folders, and hyperlinks are maintained when your final construction documents are compiled, creating a robust yet easy-to-navigate pdf of your entire project from start to finish. 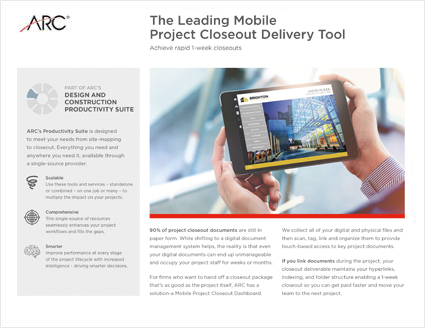 Achieve rapid 1-week closeouts with ARC’s leading mobile project closeout delivery tool. Give owners the power and ease to easily search for and access project information when they need it in the future. Your project documents contain invaluable information that owners, stakeholders, and facilities managers need. Our comprehensive closeout solution makes it easy for you to deliver it in a searchable and robust digital format, giving them access to the critical information they need to know whenever they need it. Closeout faster with up-to-date and accurate as-builts that maintain your document metadata and navigational links created throughout your project. Generate as-builts that are accurate and up to date at project closeout and at any stage of your project to create a historical record of your project at various milestones. Your closeout documents maintain their indexes and structure, so your attachments, photos, and markups remain linked just as you intended, and create a comprehensive timeline of your build. Our fast-turnaround closeouts include as-builts, O&M manuals, warranties, subcontractor lists, facility contracts, test reports, approved submittals, permits, and equipment schedule. Every hour spent chasing documents is an hour you could spend focused on growing your business. With our streamlined solution, you can achieve closeouts in just one week, shaving days or even weeks off the typical closeout process. Ready to see what you can achieve with all that extra time? Call us today at 855 500 0660 to get started. From a project standpoint, we are able to share information across all platforms of the project as well as produce a deliverable we can hand over to facility management at the end.